I visit Lao Garden every week to devour their authentic Laotian food, but the menu also features tasty Isaan cuisine and Vietnamese hot pot. Expect speedy service, a cool atmosphere and top dishes - here’s why Lao Garden is one of my favourite Bangkok restaurants. 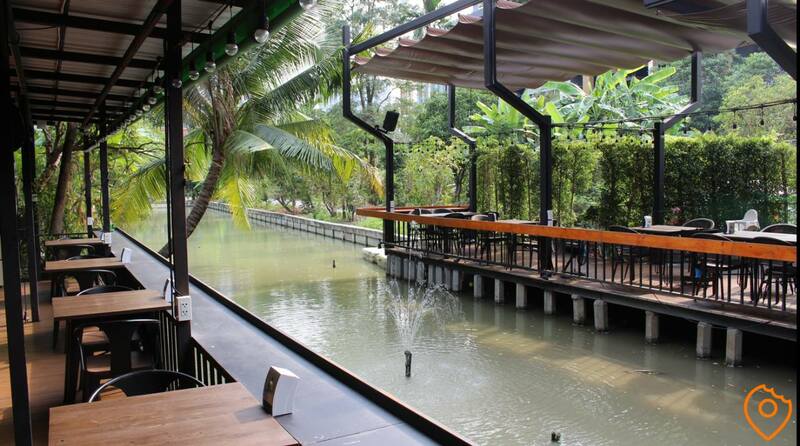 Lao Garden is located next to Habito Mall in On Nut, which is surrounded by trees and set near a small canal. The green backdrop transports you away from the chaos of Bangkok and in the evenings, decorative lights create a cosy, warm dining experience. Habito Mall is a popular spot for the expats living in the condos around Habito Mall, but also for locals living close to Habito Mall. Lao Garden is by far the most popular restaurant in this area, as it has this unique atmosphere that you won't find anywhere else in this area and because it has a wide range of delicious and affordable foods. 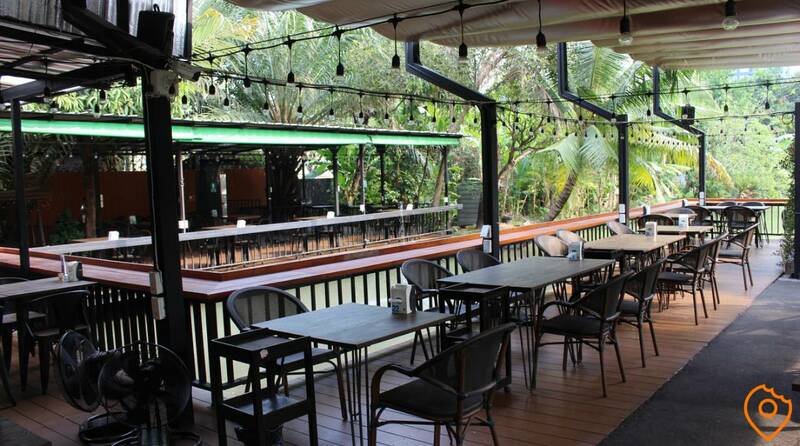 But people don't only come for the food: Lao Garden is also a great place to simply enjoy some low-key beers with your friends as well. Something that I really like about the restaurant: As the restaurant is built around the water, it usually attracts a lot of insects. At Lao Garden, they placed many fans on the floor that blows all the mosquitos, that want to sting your legs, away. The menu at Lao Garden is quite extensive with mostly Laotian and Isaan options. 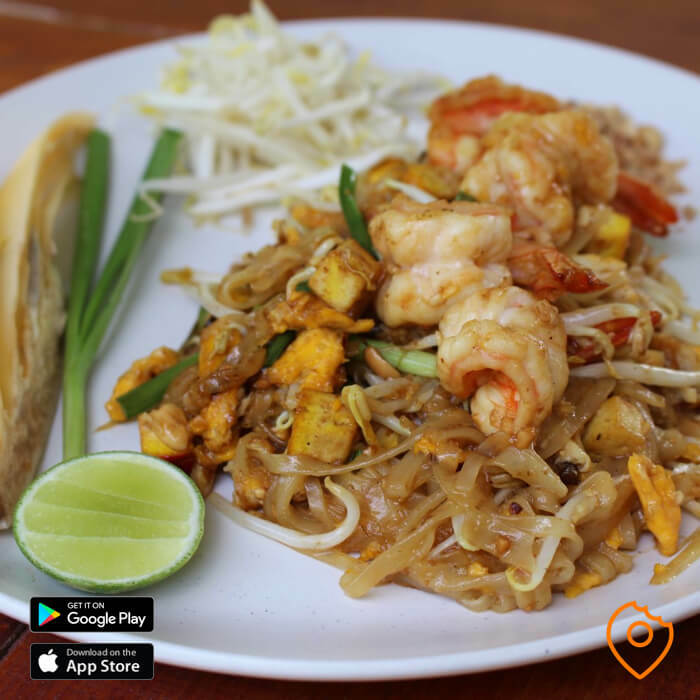 You can order the usual local suspects such as the Pad Thai (120 THB), Som Tam Thai Style (70 THB), Laab Kai (100 THB), Pad Kra Pao (120 THB) and Deep-Fried Pork (120 THB). In my opinion, the Laab Kai, the Pad Kra Pao (chicken) and the Deep-Fried Pork are seriously good. I visit this restaurant regularly and have to admit that I almost choose at least one of these three treats every time when I visit Lao Garden. What makes these dishes so delicious? 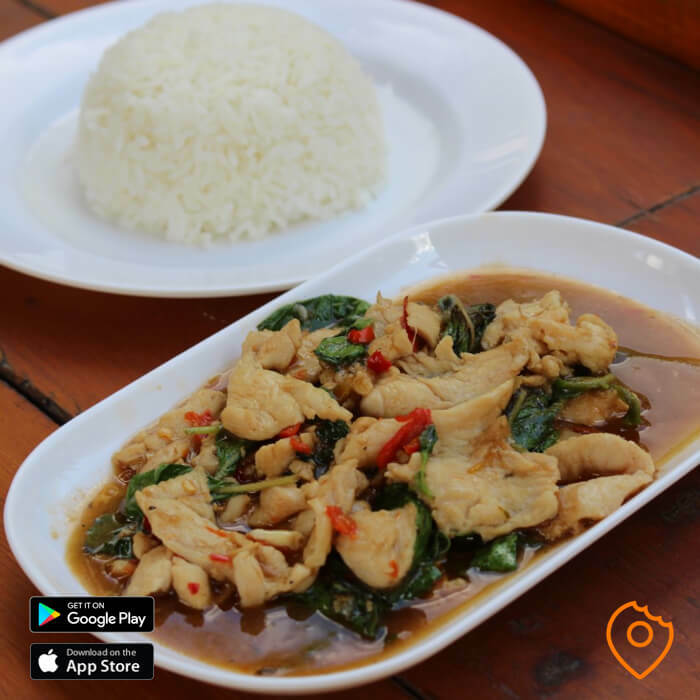 For starters, the Pad Kra Poa is served with plenty of chillis and the sauce has a strong garlicky flavour. 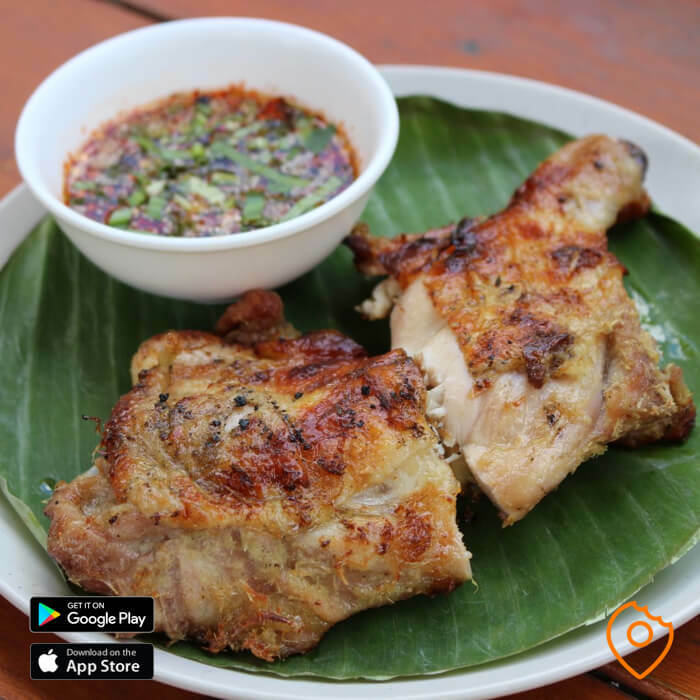 As for the Laab, the chicken itself is nicely lean and flavorwise it has an authentic taste: again, with plenty of chillis. 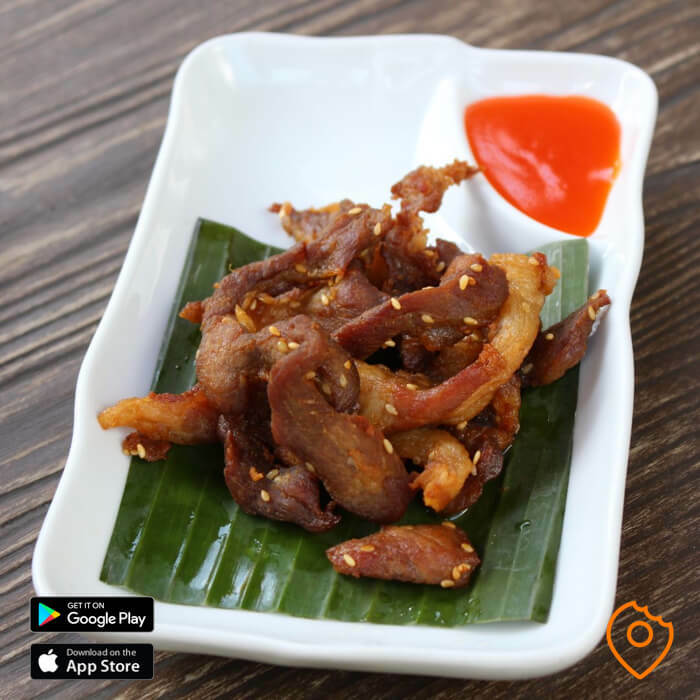 The Deep-Fried Pork is not spicy at all, but it is nicely flavoured before it gets deep-fried. The good thing about the pork is that it is crispy on the outside, yet soft (and not chewy) on the inside. The adding of the sesame seeds give the pork even more flavour! While ordering my favourite dishes, I do ask for two small changes. Personally, I am not a great fan of intestines and the standard Laab Kai comes with liver, so I order it without liver bits. As for the Pad Kra Pao, I ask for large chunks of chicken instead of minced chicken, which makes the chicken nicely tender. One of the specialities at Lao Garden are the grilled meats. The moment you walk close to the restaurant, you can already smell that typical smoke. 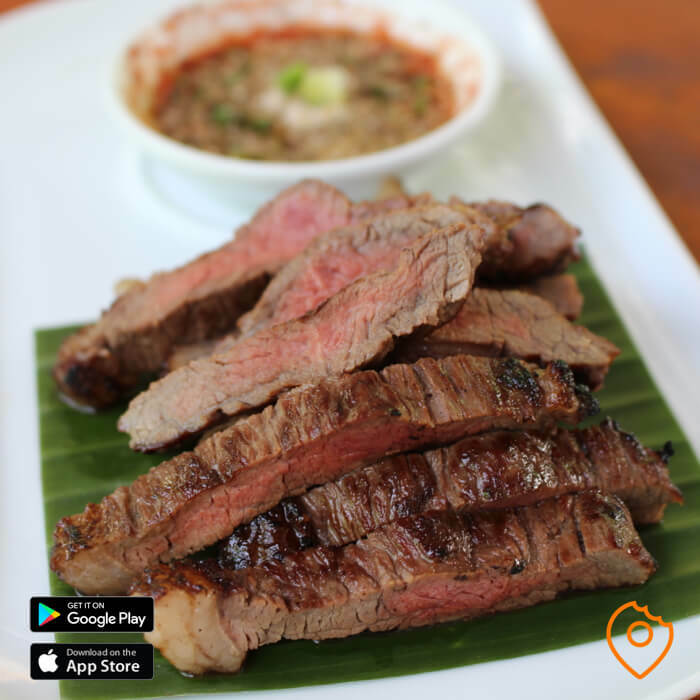 All the grilled meats are served with deliciously spicy JAEW sauce and are incredibly tender. My personal favourites are the Grilled Beef with JAEW Sauce (150 THB) and the Grilled Chicken with JAEW Sauce (110 THB). Obviously, the meats have that deep smokey flavour. As you perhaps already noticing, the variety at Lao Garden is large. But there is more. 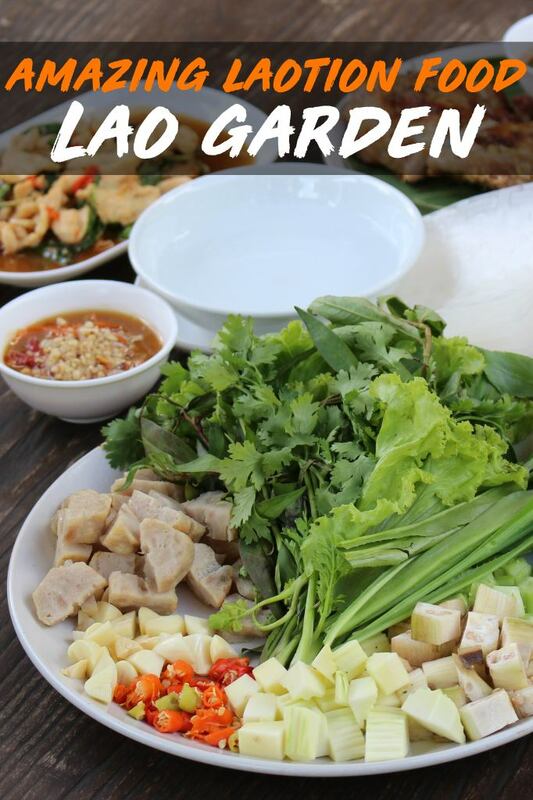 At Lao Garden, you will find some specialties that you won’t find anywhere else. One of their unique dishes is the Spicy Hot Pot (300 THB). This soup is served in a clay pot and is packed with herbs. Adding veggies, meat and seafood enhances the soup’s flavour. 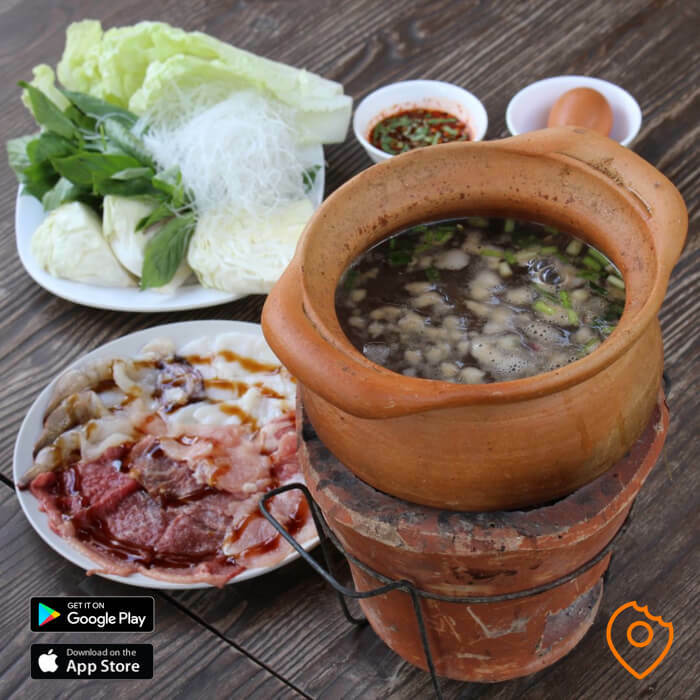 The Hot Pot is one of the most popular meals you can order at Lao Garden and extremely popular among the locals who visit the restaurant. 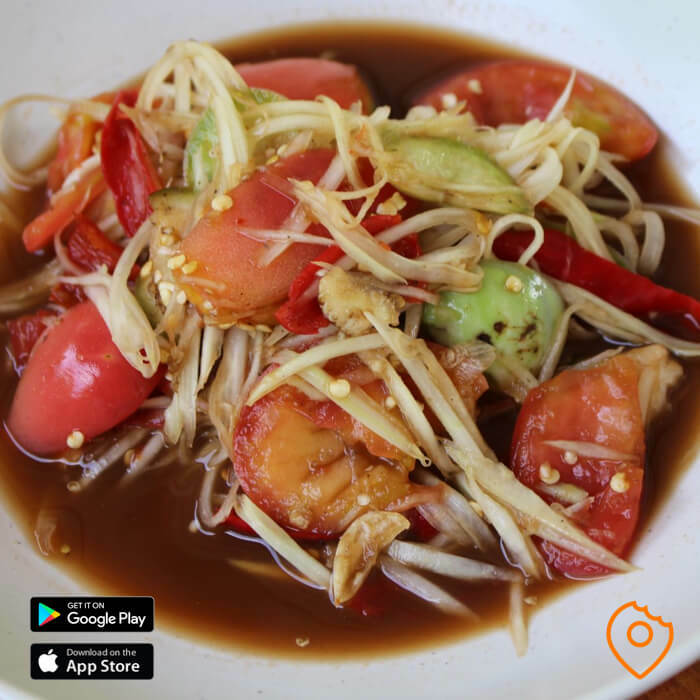 Another noteworthy dish is the Nam Nhen (250 THB), which has Vietnamese origins. 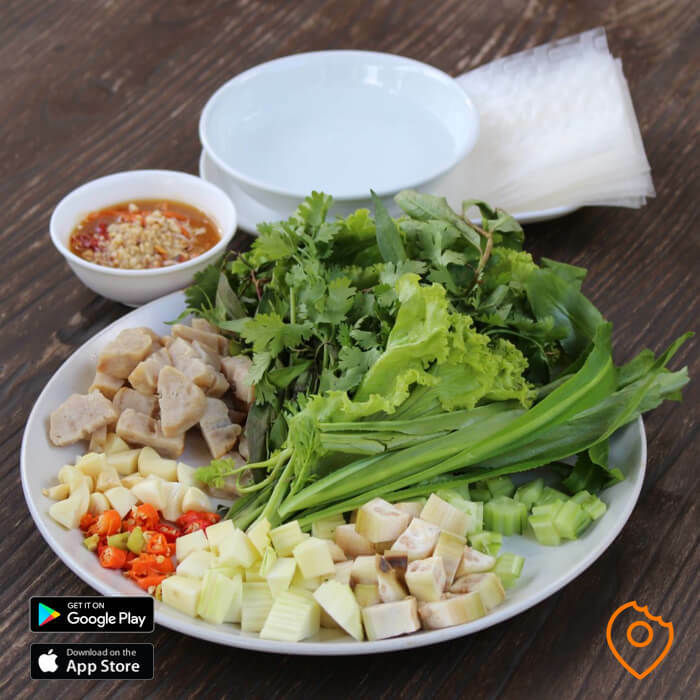 Nam Nhen is a plate full of chopped ingredients: raw banana, raw mango, cucumber, chili, garlic, Vietnamese sausage and a handful of herbs and lettuce leaves. First, you soak some rice paper in water until softened, then add ingredients to suit your tastes and add some sweetened sauce and. Finally, wrap the folded rice paper package up with one of the lettuce leaves. The results: one big taste explosion! For those who have never tried this dish before, here is how to prepare Nam Nhen. Once the rice paper is soaked in water, you can easily lay it on your hand palm. With your other hand, you will add the ingredients, herbs and sauce to your taste. Fold each corner of the rice paper over the ingredients until you have a tight package. As the rice paper gets dry, it gets sticky as well so your package won't fall apart. All you need to do now is put the rice paper package in a lettuce leaf and start eating it! Recently, Lao Garden added burgers to their menu, which is pretty successful for the expats. Personally, I haven’t had any desire to try them because their Laotian and Thai food is so delicious and satisfying. Before you leave the restaurant after a satisfying meal, you can pick one of the ice creams for free. Especially the coconut ice cream is very welcome after eating some of their spicy food. 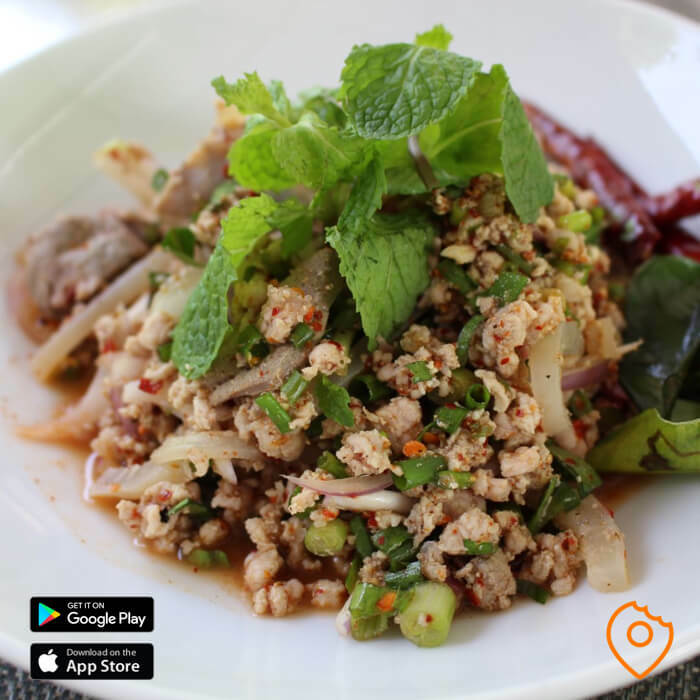 Yes, that is right: when you visit Lao Garden and order Isaan and Laotian food, you will get some very spicy food! Overall verdict: Lao Garden is one of my favourite local restaurants in Bangkok as it has a huge range of quality dishes which are all reasonably-priced. I can easily visit this restaurant multiple times per week without getting bored of the food. I love the laid-back atmosphere, which is perfect for a quick bite but also for hanging out all evening with friends, enjoying ice-cold beers.